Have your snake & eat it, flambé-style! 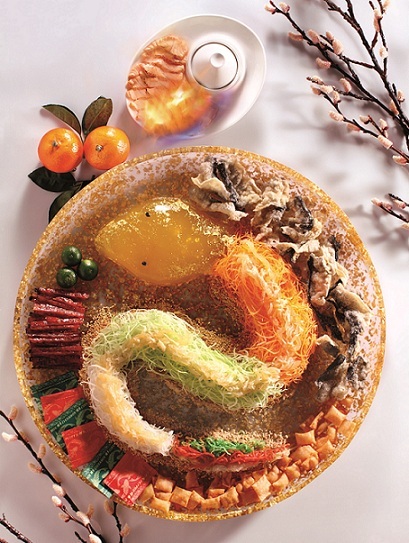 Usher in the New Year of the Snake at Feng Shui Inn (风水廷), as tasty novelties await you. A visually stunning lobby greets you as you approach the renown Cantonese restaurant, located on the G2 level of Crockfords Tower, a "by-invitation" only all-suite hotel. Celebrate your Chinese New Year festive fine dining at Feng Shui Inn, & indulge in auspicious 8-course sets for 10 from S$1388. This year's Yu Sheng at Feng Shui Inn promises to be extraordinary, as the Chef dished out his Flambé Salmon Lo Hei (火焰七彩鱼生捞起). Chinese Head Chef Li explained that a special-grade Catfish from Hong Kong is used to make these Crispy Fish Skin, & the BBQ Pork seen here is made from Kurobuta Pork. Priced at S$88 for 3 - 6 pax & S$128 for 7 - 10 pax, the new creation is a medley of refreshing flavours & colours, combined with thinly sliced fresh Salmon infused with the Chinese Wen Jun Wine (文君酒), presented with a colourful orangey burst of flames. If you've money to splurge, why not try their Gold Ingot (金银满屋) @ S$688 for 8 - 10 pax, which consists of Braised Premium Dried Seafood Wrapped with Pastry Skin? Feng Shui Inn also offers goodies like Pineapple Tarts, Kueh Bangkit, Assorted Cookies etc, which are available from 11 Jan – 24 Feb 2013. The CNY goodies comes in a magnificent Magnetic Magic Box with easy-to-carry straps. The box opens up to a 3-tier compartment containing your CNY Goodies. These gift boxes are available for Home-made Pastries from S$28/box. If you're looking for something unique, the Home-made Pineapple Pastry with Imperial Bird's Nest @ S$68/box, is a must-try. The flaky pastry, coupled with the sweet & sour pineapple + bird's nest is simply yummi-licious; a harmonious tart fit for the King! Be sure to check out these Honey Cornflake Cookies (42 pcs/tin, S$22), & the Home-made Premium Coffee Walnut Pastry (S$28/box) @ Feng Shui Inn! Special thanks to Khushil for organizing this event, & Sin Yee, Juan, Mark & Sammy for hosting us. For more Chinese New Year Reunion Menus, check out Festive Menus At Hollywood China Bistro & Sam Leong's Forest! gosh very nice presentation of the Yee Sang. Jess, it's the Year of the Snake! I'm the Queen Snake this year. Hahaha! Scare of snake, but snake is my good friend in feng shui..cos I am a monkey..hahaaa. very nice presented yee sang..
Agnes, I heard snakes & monkeys make good friends too! Hahaha! Thats new for me - pineapple with Birds Nest!!! Looks so fabulous and its time I should search for the same so that I can indulge into it too. Nava, it's my first too! Hahaha! Happy shopping, my dear! The Yee Sang is awesome!! Love it. Hong, the plating is simply gorgeous! Hong, u don't live in Penang, do u?? Kim, just imagine ourselves chilling out there. Real snake? Pls don't eat Me! Hahaha! Charmaine, would love to be their VIP! Heehee! Ooooh.....love everything here! Makes me miss home. Christmas has just been over and CNY is coming soon. Looks like my tummy has no time to rest......haha. By the way, thanks very much for letting me know about the link of your blog on my post that's not working. It looks like if I use '.co.uk' then it works. How strange! Take care and hope you have a lovely weekend. Mary, so r u heading back to M'sia for CNY? co.uk?? That's so strange. Thks for linking up, my dear! Sorry Shirley, Missed you with all the action going on at my end. Love to be back around CNY. Happiness and good luck is all I wish for you my dear friend.!! Ash, pleasure to have u back! Looking fwd to more of your posts, sweetie! Why does Singapore provides so many awesome dishes! Especially the yee sang, it's really one of a kind!! Superbly pretty yet delicious! Michelle, tempting u?? Must visit S'pore more! Feng shui inn have very unique way of presenting their foods. A simple dish turns out very pretty with their presentations. DS, hope u'll have the chance to try out their dishes. Have a good weekend, dear! This is soooo cool!! We´ve never seen a meal served this way but it looks awesome! We´d totally eat that snake! Time of the year for yu sheng again! yeah! The gift box look very elegant. Bird nest in the pastry... yum yum!! Have a nice weekend, busy making cookies? Pepper, time will come very soon at the blink of the eye!